The 12th edition of FoodTech, Northern Europe's largest food technology fair, opened the doors of the MCH exhibition center in Herning, Denmark. FoodTech offers three days focusing on the food industry, conferences, awards and record-wide activities. 309 exhibitors were ready to showcase the food technology of the future when FoodTech opened the doors to the 12th edition of the food technology business in MCH Messecenter Herning. The many exhibitors and collaborators once again contribute to exhibitions and record-keeping activities, and Georg Sørensen, CEO of MCH A / S, also used his welcome speech to send a big thank you to all those who have helped to develop the show. FoodTech has never bid for as much content as this year. The many news presented by exhibitors and the collaborators' strong range of knowledge-raising activities and conferences combine professionalism, innovation, knowledge sharing and personal presence, Georg Sørensen said. 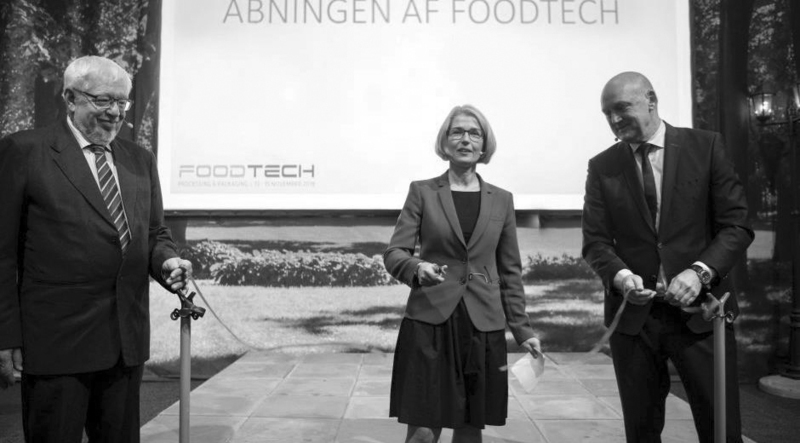 As part of the official opening of FoodTech, the coveted FoodTech Award was awarded. 59 products were set for the award, of which seven were nominated for the FoodTech Awarden, which was given to the most innovative and prospective news. The chairman of the judicial committee, Professor Jens Adler-Nissen, presented the seven nominees and then co-sponsored the Georg Sørensen Prize and 50,000 kroner to the winning company, Sani Membranes from Allerød, who won for its Benchtop Membrane Filter VIBRO-L, a membrane filtration principle. "It means incredibly much for us to win the FoodTech Award. It's a very big gift. The price can definitely help open some doors for us so others discover that we are there. We are a very small company and we have only been running for five years, so it is important for us to make our name known in the industry," said Henrik Hjelmsmark, Director of Sani Membranes. Let FoodTech 2018 be the place where we learn from each other and find new partners - where one plus one gives three. It's good for the business and it's good for innovation. Have fun with FoodTech 2018. FoodTech 2018 also offer three days of record-wide activities. Visitors professionals can gain new knowledge and inspiration in, among other things, the new concept hall Tech City in Hall F, where lectures, exhibitions and expert sessions are complemented by the World Congress on Sustainable Water Consumption IFC World Congress and the Innovation Competition FoodTech Challenge & InnovateFood.dk, where 35 students and one A range of experts over three days will find solutions to relevant industry issues. In addition to this, FoodTech also offers the International Food Contest food contest, featuring Denmark's best food products, exhibition of nominees for the ScanStar award, a special FoodLab area with laboratory equipment for the food industry and conferences on hygienic design, food contact materials and more. FoodTech takes place 13-15. November 2018 in MCH Messecenter Herning.